The herd of 17 chalicotheres [kal-ik-o-theers] – large, ungainly creatures with the heads of tapirs, the thick necks of horses, and the bodies of giraffes – snort the air as they cautiously approach the waterhole. They are parched and starved. The prolonged drought has killed nearly all the trees and scrub in the area they normally browse, and, like the host of small, pony-sized Menoceras (rhinos), many of which already lie decaying at the water’s edge, they also will soon be dead. The chalicotheres crowd into the deepest part of the pool, a six-foot waterhole below a crumbling, three-foot sandy bank. Standing in the tepid water, they slack their thirst and wait while the bulls hold a hungry pair of entelodonts [en-te-lo-donts] at bay. 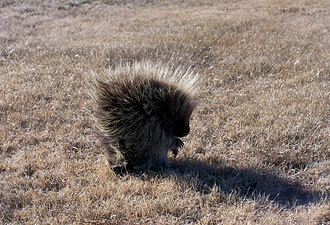 The pacing entelodonts pose a serious threat, for although they are scavengers, they are formidable. Resembling giant warthogs on steroids, they have huge, vise-like jaws filled with wide, flat teeth that can crush bone and rip and tear flesh. It was a stand-off until nature intervened and ended the struggle. Exactly how remains a mystery. Perhaps a sudden thunderstorm kicked up a powerful wind that lifted vast clouds of sand and fine, glassy volcanic dust into the air. After a few hoarse, dry coughs, all the creatures at the waterhole dropped where they stood. The waterhole soon dried up, and these odd creatures, distant relatives to modern-day mammals, were entombed by later floods of sediment and blowing sand. In the ensuing 19 million years, the waterhole was buried under 52 feet of sedimentary rock, most of which eroded over the last 4-5 million years. 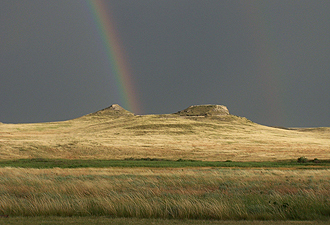 Only two small buttes, or hills, remain—time capsules from the Miocene epoch that were carefully pried open by paleontologists in the early part of the 20th century. A self-guided, accessible trail allows you to explore at your leisure the historic fossil sites and the modern prairie. Inside the park’s visitor center, a diorama with full-size skeletal replicas of entelodonts and chalicotheres continues to amaze visitors. It was “Captain” James H. Cook, a local rancher, who discovered the quarries on what was later called Carnegie Hill. Cook was a man with many interests, and during his time at Agate Springs Ranch (1879-1942), he befriended Lakota Chief Red Cloud and his family, as well as members of the Cheyenne tribe. Every summer, Cook hosted his Indian friends at his ranch and treated them with generous, unfailing hospitality and respect. 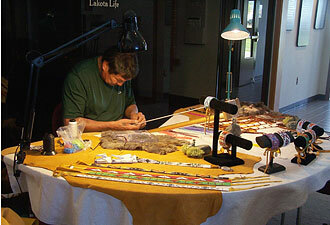 The Indians, in turn, presented him with priceless handmade objects of unique historical and cultural significance. It was tacitly understood that Cook would preserve these relics of their early culture so they might, in the future, illuminate the proud story of the people who created them. These items, numbering more than 500, are on display in the James H. Cook Gallery. And on long summer weekends, you may still find contemporary artists visiting the park and sharing their Native American culture, which is very much alive.